Lately, my diet has been heavy on raw vegetables, berries, meat, and eggs. It’s incredibly easy to find 10 minutes in the evening, just once or twice a week, to put together little lunch kits. I also found through extensive testing that it’s hard to want to take the time to put together lunch in the morning before work. I am lucky if I manage to put myself together before work. This evening, I made lunch veggie containers for the rest of the week that include sugar snap peas, raw carrots, and about an ounce of mild cheddar block cheese. I measured out 1/4 cup of roasted pumpkin seeds and 1/4 cup of sunflower seeds for morning snacks. 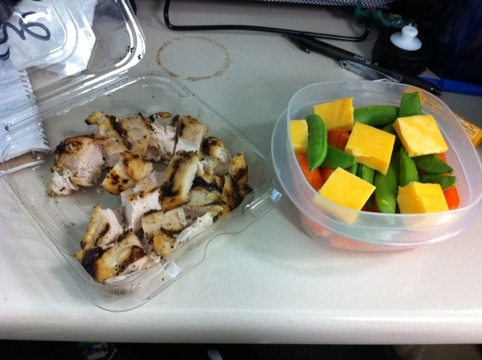 I threw some sliced lunch meat in a bag, though I sometimes take grilled chicken. I also picked up read- to-eat hard boiled eggs for breakfast noshing if I don’t get around to scrambling some at home. This will keep me going through the day. In the evenings, my boyfriend makes me something with baked, roasted, or grilled meat, plus vegetables and sometimes limited cheese. He is super supportive and tries his best to make eating at home within my new dietary restrictions a pleasure for us both. For dessert, I eat frozen unsweetened berries. It is better than ice cream. Yes, I would rather have completely guilt-free frozen berries that I know are good for me than the heavy sugar and probably disappointing taste of whatever kind of low sugar, low fat ice cream I would choose in an effort to eat healthier. I am so satisfied with the food on my new diet. I caved while on vacation a few times and got a couple of burgers, a couple of servings of fries, and slices of the best cake I have ever eaten (if you haven’t had it in ages, it is incredible). But I haven’t craved anything like bread or sweets. I love the freshness of the plant life I’m eating. My ideal eating situation for the rest of my life would be an unending fresh salad bar with hard boiled eggs and deli sliced poultry always available. So this new eating situation is close to perfect. And it’s so easy to stick to…as long as I plan ahead. This entry was posted in food, health and tagged food, health, low carb, paleo. Bookmark the permalink.